It is a lightweight shoe that provides flexibility, especially in the mid-sole section. Most runners were impressed with the durable outsole of the Peregrine 6. The 6th version comes with a mesh material that is comfortable and non-irritable to the skin. Reflective sections improve the visibility of this shoe in low lighting conditions. The premium sock liner of this footwear has anti-odor and anti-microbial properties. It has an improved cushioning system that greatly surpasses the previous versions. The trail-specific build of the Saucony Peregrine 6 makes it ideal for treks on the unpredictable paths. Runners usually complain of having blisters because of its back heel plate, especially when climbing hills. The shoe has a moderately high price tag. There were runners who wanted the Saucony Peregrine 6 to have a bit of stability for proper foot pronation and support for the arch. The Peregrine 6 is a running shoe that’s created for the various off-road trails. It is a running shoe that is designed for taking on the harsh nature of the outside environment. It’s sturdy, reliable and comfortable to wear. It’s a great running shoe for neutral runners. The Saucony Peregrine 6 is old in shoe years as the 8th has just been released. But, I was injured for several months after buying the 6 and just got my 150th mile in these shoes. 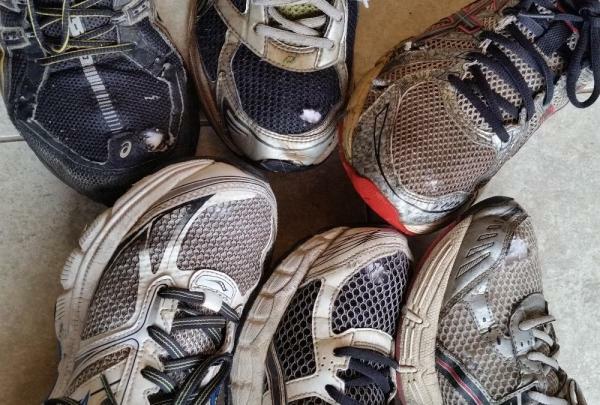 I have six different shoes ranging from 400 plus miles to just over 100, all with holes or developing holes where my big toenail hits the upper. My right great toenail angles upward just enough to grind away at anything it touches. After years of looking for a lightweight trail shoe with a reinforced toe area, I ran (pun intended) upon a Merrell and Saucony local fun run where we could demo shoes from various reps. The Peregrine had a better fit and feel than the Merrell. The reinforced toe area is molded into the FlexFilm upper providing a seamless, flexible feel. The solid yet flexible plastic film offers protection for the mesh upper and is durable enough to handle my vicious toenail over 150 trail miles with no sign of wear. In the first demo run, I noted a low ride. My foot seemed to melt into the sole of the shoe which provided a confident feel. The protective heel cup and the comfortable collar added quilt and security to my aging ankles. The only negative on that first run was the rubbing on my lateral malleolus. If you are not familiar with heel anatomy that is the bone on the outside of your ankle. Maybe my feet ‘melted’ too far down into the shoes. The aesthetics of this or any shoe is not a big selling point for me, but it sure is a bonus to get one that looks as good as it feels. The shape and contour is not clunky like some trail shoes. Not too slim and just enough flair on the forefoot for extra stability. The aggressive outsole can be seen from the side profile. Just a clean fresh look with colors that seem to work well together. This shoe came in three color schemes. The Peregrine 6 has a symmetrical lug outsole on a semi-curved last. Saucony’s PWRTRAC rubber outsole is formulated to provide enough elasticity to grip yet maintaining strong abrasion resistance. The forefoot area is protected with their External Bedrock Outsole underneath the PWRTRAC rubber. It is a stiff, lightweight protective plate to shield and dissipate the impact of rocks and rough terrain. Its EVERUN midsole gives a cushioned ride with a high level of energy return. As mentioned previously, the upper is a lightweight molded mesh requiring fewer fabric layers, less stitching and therefore more flexibility and comfort. The tongue is padded and attached to each side below the laces with thin neoprene fabric to keep the dirt and debris out. It also keeps the tongue centered well. At 9.5 ounces (270g) it is not the lightest trail shoe, but it provides protection and strength without the feel of hiking boots. The heel cup not only gives a solid hold on your ankle, but some obvious, hidden, and informative details as well. The obvious is the make and model of the shoe, the hidden is the longitude and latitude of the original Saucony factory in Kutztown, Pennsylvania founded in 1898! And the informative is the 4mm offset from heel to toe. The laces nine-thread weave allows me to refrain from double tying them as the thicker orange thread provides enhanced friction to the single knot. They also incorporate all the colors of the upper. The overall structure of this shoe is amazingly solid and comfortable for its lightweight and low-to-the-ground feel. The Peregrine 6 is one of the best trail shoes that I have worn in the past 20 years. The aggressive yet simple tread design grips the muddy trails yet releases the mud easily so you’re not carrying that extra weight for miles. The deep lugs though will hold small twigs. The protected forefoot helps alleviate the pain on some of the rocky trails I frequent. Our current weather brings snow to the terrain and the Peregrine 6 gives plenty of traction in the snow and ice, and with the right socks, protection from the cold. The lack of cushion is a positive for me and others who like to feel the ground. The grip and stability of this shoe bring confidence in tight turns on the trail. The only negative to this shoe was noted above - the slight rubbing on my ankle bone on early trail runs. To solve that problem I placed an old insole cut to size under the rear of the insole to give a 2mm rise and no more ankle rubbing. A bonus for me is that a 6mm drop is optimal for my calf muscles. I can’t find any more Peregrine 6 in size 9.5, so my next shoe is the 7. Why not the 8? The pictures of the 8 show the toe protector removed, ugh! The outsole is also less aggressive. The overall feel of the Saucony Peregrine 6 is comfortable. It is not soft or cushy, so if you like that feel it is not for you. It provides a feel for the ground without giving up protection. It gives enough cushion even on a long trail race that I am not crying for a pillow. Just yesterday, I purchased the Peregrine 7 on sale. The original price of the 6, 7 and 8 is $120. That is somewhat steep, but it provides the grip, comfort and feel I want and need in a trail shoe. Additionally, I am hopeful it will continue to look good long after its useful running life since it shouldn’t have an unsightly hole in the toe. This is a fast and lively trail runner that provides a lot of great feedback while still protecting the foot. You're gonna love the feel and the performance. The Saucony Peregrine 6 is a top notch mountain racer/trainer geared toward technical terrain, yet versatile enough for all around running at just about any speed. Saucony’s most popular trail shoe gets a thorough makeover in the Peregrine 6. The first most visible change is the lace, which is just about as colorful as the previous model. However, the new one has definitely more texture, which makes tying very convenient. The texture will also hold the lace firmly in place from the first to the last stride. Up next is the tongue and its enhanced padding. The improved padding in this area will certainly add to the comfort level of this shoe. Saucony is also introducing a gusseted tongue that is about 2/3 of the way to the top. It will be handy in keeping trail debris off better than ever. Another very clear change is a wider toe box. Most avid fans of the Peregrine have noticed that the 6th installment offers the widest toe box compared to any of the past versions. A wide toe box means better room to splay and accommodate runners with slightly wider foot. Some runners also loved the added space in this area as it somehow makes the shoe more breathable. The heel also has a new thermoplastic support. Saucony redesigned the heel to provide better lockdown when running on uneven terrain. The TPU support cups the heel very well for enhanced security on challenging trail surfaces. A newly-designed External Bedrock Outsole plate adds underfoot protection. This is made of more durable material without adding weight so protection from sharp objects will not break down easily. One update that may not be readily visible is the EVERUN heel insert. The EVERUN is Saucony’s latest cushioning technology that boasts of an 83% energy return. What it does to the shoe is to make the heel a bit softer with superb rebound features. It works hand in hand with SSL EVA in the forefoot to enhance the shoe’s transition. The new feature will be very noticeable by traditional heel strikers. The biggest update and easily the most apparent when one looks underneath the shoe is in the outsole. In the 6th version of the Peregrine, Saucony incorporates its venerable PWRTRC outsole, which the company declares as having 3 times more grip than the usual industry rubber. The countless multi-dimensional 5mm lugs have really impressed a majority of runners as they provide serious grip on different and difficult trail surfaces. The added space in the forefoot is the only change in the fit that runners have come to expect from this line. This wide toe box makes the Saucony Peregrine 6 even more versatile as runners with inflexible and wide feet can also have their own fun on the trail in this shoe. The heel and the midfoot are of standard measurements. Saucony is offering the shoe under the standard widths of D for the men’s and B for the women’s. The shoe has regular measurement in length with sizes 7 to 14 for the men’s and 4 to 11 for the women’s. Saucony recognized the importance of the outsole’s performance on the trails that it has added the PWRTRC rubber compound in the Peregrine 6. It is a special compound made by Saucony’s tech specialists to enhance by several levels the traction of the shoe. This durable outsole material is also present in the Saucony Peregrine 8. The most prominent features in the new outsole are the aggressive 5mm lugs that are scattered all throughout the shoe, including the perimeter. These tough-looking lugs are also superb when the runner takes on loose rocks and shingles as they are flexible enough to just distort themselves a little to hold on to stones and other trail objects. This tad of flexibility and softness play an important role in enhancing the cushioning as the midsole is somewhat very firm. It will keep the runners from feeling beat up. The flared lugs also cover the perimeter, which adds leverage no matter which way the runner positions the foot on the ground. Sitting between the outsole and the midsole in the forefoot is the EBO or the External Bedrock Outsole. While EBOs are a mainstay in the Peregrine, the Peregrine 6 sports a new nylon and molded material that not only fits naturally, but is more durable and flexible than ever. It serves as the buffer that protects the foot from sharp trail objects. EVERUN is actually made of the same material that currently makes the Boost so popular. However, instead of forming them into tightly-grouped and capsule-like energy balls, the material is made like a traditional midsole foam but carries more resilient and more responsive features that does not suffer in different weather conditions. The upper is a combination of an abundance of synthetic overlays, mesh, and the FLEXFILM. Saucony’s utilization of the overlays extends all the way to the toes for added protection. The FLEXFILM is basically some sort of plastic-material for maximum upper durability. It acts like an exoskeleton that holds the upper together. What makes the technology shine is it does not take away the shoe’s ability to adapt very well to the runners’ movements while it provides structural integrity to the upper.